Who invented the Iron? The name of the person credited with inventing the Iron, originally called the "electric flat iron" was Henry W. Seeley (1854 - 1908). Henry W. Seeley is not only famous as the American inventor of the Iron but also as a mathematician and businessman. When was the Iron invented? Henry W. Seeley invented the "electric flat iron" in 1882, during the Second US Industrial Revolution / Victorian period of invention (1850 - 1914). 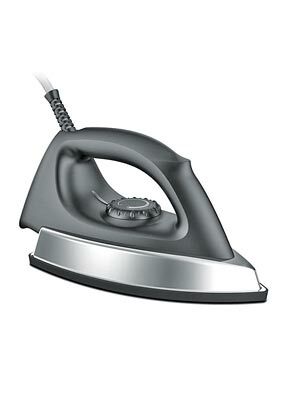 Definition of the Iron: The electric iron is defined as a handheld electrically heated household appliance that uses the combination of heat and pressure to smooth and remove wrinkles from clothes and household linens. Fact 1: Who invented the Iron? The Iron was invented by Henry W. Seeley in 1882 during the Second US Industrial Revolution era of inventions (1850 - 1914). Fact 2: Who invented the Iron? Prior to the invention of the Iron in 1882, the history of ironing went back over one thousand years when the Chinese used metal pans filled with hot coals that were pressed over stretched cloth. Fact 3: Who invented the Iron? Wealthy Ancient Romans used a screw press in the first century BC for keeping linen smooth and neatly folded. Fact 4: Who invented the Iron? People used stones, wood and glass for smoothing material on smoothing boards. The slickstone, a handsized, smoothed and rounded flat stone was commonly used in the Middle Ages to rub the wrinkles out of clothes and fabrics. Linen presses were used to flatten cloth from the Medieval period right up until the 19th century. Fact 5: Who invented the Iron? Blacksmiths then created D-shaped flat irons with a handle, made from cast iron, heated on a stove or fire that were used for pressing clothes. Charcoal irons followed that had a hollow inside that was filled with smouldering charcoal. Fact 6: Who invented the Iron? Any method of ironing, without the benefit of electricity, was a hot, time consuming and arduous job that required constant attention to the temperature of the device. Irons had to be kept meticulously clean, polished and lightly greased to avoid rusting. Fact 7: Who invented the Iron? In 1858 David Lithgow, an American inventor from Philadelphia, was one of the first inventors to patent a gas iron. Gas irons were categorized as liquid fuel irons, as were other newly invented irons that were heated, using kerosene, gasoline and methylated spirits. Fact 8: Who invented the Iron? Liquid fuel irons, including gas irons, represented a major improvement over smoothing irons and charcoal irons but it was the invention of Electricity that was to make this laborious task much easier. Fact 9: Who invented the Iron? Electricity become available as a source of power in homes towards the end of the 19th century and voltages used for electric power transmission increased throughout the 20th century. The power of electricity led to new innovative inventions such as the electric iron. Fact 10: Who invented the Iron? The inventor of the iron, or as he called it the "electric flat iron" was Henry W. Seeley who was born on July 2, 1854 in Richville, Kentucy, United States and died on November 9 1908 in Shermer, Rhode Island. Fact 11: Who invented the Iron? The early years of Henry W. Seeley were spent in Richville, Kentucy, United States where he was raised by his family. Little is known about the early life of Henry W. Seeley but he married Margret Seely and the couple had three sons, Mark, John, and Gintal and two daughters, Jennifer and Marcey. Fact 12: Who invented the Iron? Following his education he trained to become a lawyer and went on to qualify and register on the list of registered patent attorneys and agents. As a patent attorney Henry W. Seely was licensed to practice and represent clients before the United States Patent and Trademark Office (USPTO) by preparing and filing patent applications. Fact 13: Who invented the Iron? His job as a patent attorney, during the US Second Industrial Revolution, allowed him to observe the many inventions developed by the famous inventors of the period. Fact 14: Who invented the Iron? Henry W. Seely, together with two other patent attorneys, Richard N. Dyer and Lemuel W. Serrell, became the patent attorneys of one of the greatest inventors of all time - Thomas Alva Edison (1847 - 1931). Fact 15: Who invented the Iron? The name of Henry W. Seely appeared as a witness to over 100 patents filed by Thomas Alva Edison including those for the Cylinder phonograph, the Electric battery, railroad telegraphy, and the Incandescent light bulb. Fact 16: Who invented the Iron? Working for Thomas Alva Edison on his legal team, Henry W. Seely was in the forefront of witnessing exciting new inventions as he was involved in patents, contracts and other legal concerns. This must have encouraged and inspired him to come up with his own invention. Fact 17: Who invented the Iron? The idea for the invention of the electric iron is not known, but as a married man with five children working in a profession that required neat and tidy clothes he must have realized that the new invention of electricity could be applied to an ironing device. Fact 18: Who invented the Iron? His invention of the electric iron utilized the power of electricity to heat a flat iron. An electric current was passed through a coil heating element the iron became very hot. The heat was transferred to the smooth, flat surface of the base plate allowing the user to iron clothes. Fact 19: Who invented the Iron? Henry W. Seely was awarded patent number 259,054 on June 6, 1882 for his invention of the "electric flat iron". Fact 20: Who invented the Iron? The invention of the electric flat iron coincided with the start of the electrification of American homes in the 1880s. One of the witnesses of the patent was Richard N. Dyer, another of Thomas Alva Edison's patent attorneys. Fact 21: Who invented the Iron? Henry W. Seeley's invention revolutionized the task of ironing making it much easier to press clothes and keep them wrinkle free. Fact 22: Who invented the Iron? To make ironing even easier the African-American inventor Sarah Boone invented the Ironing Board in 1892. Fact 23: Who invented the Iron? Henry W. Seeley died on November 9 1908, but he will always be remembered for his invention of the electric iron. Fact 24: Who invented the Iron? Joseph Myers of the Proctor company improved the iron and cord by adding an automatic heat control in the 1920's and thermostats soon became a standard feature. Fact 25: Who invented the Iron? U.S. patent 1,521,058 was awarded to Otto Walker, of Zurich Switzerland, on December 30, 1924 for the invention of the first steam iron which was introduced to the market in 1926 by The Eldec Co. of Long Island City, New York. Fact 26: Who invented the Iron? Harry Carp of Chicago, Illinois invented the Cordless electric iron and stand and was awarded patent number US2524161 for his invention. In 1962 a spray mist was added to the Sunbeam iron. Fact 27: Who invented the Iron? About 15 million irons of every variety and design are sold in the United States every year - what would we do without them?